Earlier today, Dynamo Psychotherapy announced the launch of its new Psychotherapy service, set to go live 16th September 2017. For anyone with a passing interest in the world of psychotherapy, this new development will be worth paying attention to, as it’s set to shake things up in the Hull area. Currently, even at a passing glance, a suffering person is desperate and willing to try and share problems with someone who will listen. The Owner at Dynamo Psychotherapy, Ellie Mackay, makes a point of saying “things are going to change when our psychotherapy service launches”. Ellie Mackay continues… “We are willing to support you to overcome your anxiety. We do this because we believe in a gentle and compassionate, confidential and caring service. Ultimately this is going to be a huge benefit to our customers because when struggling with mental health problems we often go to family or friend for support and this helps. But sometimes when things become too overwhelming even for them to help, we all need somebody unbiased and professional to turn to”. Dynamo Psychotherapy was established in 2013. 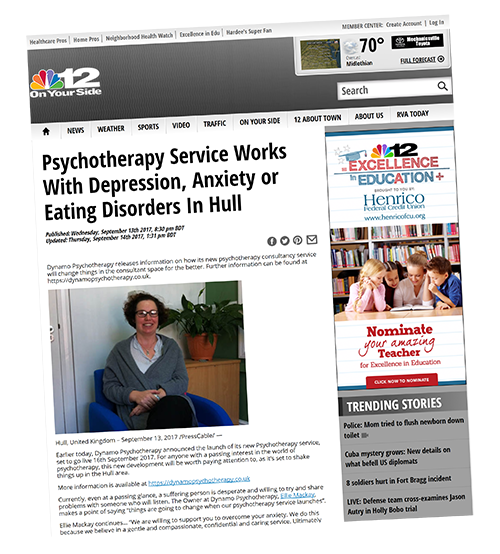 It has been doing business for 4 years and it has always aimed to help people who have depression, anxiety and other issues, no matter how passing or enduring. Ellie helps people get through their problems in an understanding, non-judgemental, safe way, whilst maintaining the highest levels of confidentiality. This alone is predicted to make Dynamo Psychotherapy’s Psychotherapy service more popular with customers in the Psychotherapy space, quickly. Dynamo Psychotherapy abide by the code of Ethics of Scarborough Psychotherapy Training institute (ScPTI). This means they offer complete confidentiality – Ellie keeps everything the client tells to herself, except if there is a risk to the client’s life or somebody else’s. Ellie receives fortnightly clinical supervision so that she can offer a service that is based on clinical guidance and best practice.